Buffdaddy Nerf: Lanard Total Crush and Zuru X-Shot Update! Lanard Total Crush and Zuru X-Shot Update! Sorry about the recent lack of posts - when finals roll around, you have to study. However, you need a break at some point. Or in my case, a few hours searching on Google. In any case, I found some great stuff! Lanard appears to be doing repaints of existing blasters for their upcoming "Total Crush" line. In this case, the X.O. Xbow is another version of the Swiftstrike. We've already seen the Sugar Shot, the sister to the Huntsman Tracker. 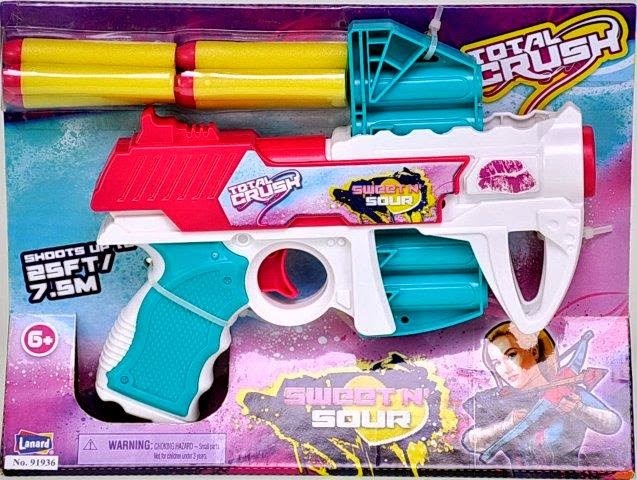 Finally, we have the Sweet N' Sour, which is a feminine version of The Scout. I actually like the color scheme for this blaster. Bright and colorful, but still with a serious shape. I only have the Retail Selling Price in South African rand (R) - it turns out Pick n Pay has a portal for franchise owners to order goods, and while you can't buy anything without the prerequisite account, you can Google around the Sign-In, so to speak, to look at items. Keep in mind these are normal retail prices we're talking about - as of late, the prices of Lanard blasters on store websites like Walmart and Kmart have been inflated, and in some cases by 100%. I see the Huntsman Tracker and Boomstick each going for $20 online, but when actually found on store shelves, they're only priced for $10. So the above retail prices should be relatively accurate for when they do appear on shelves. Now for the Xshot Blasters! 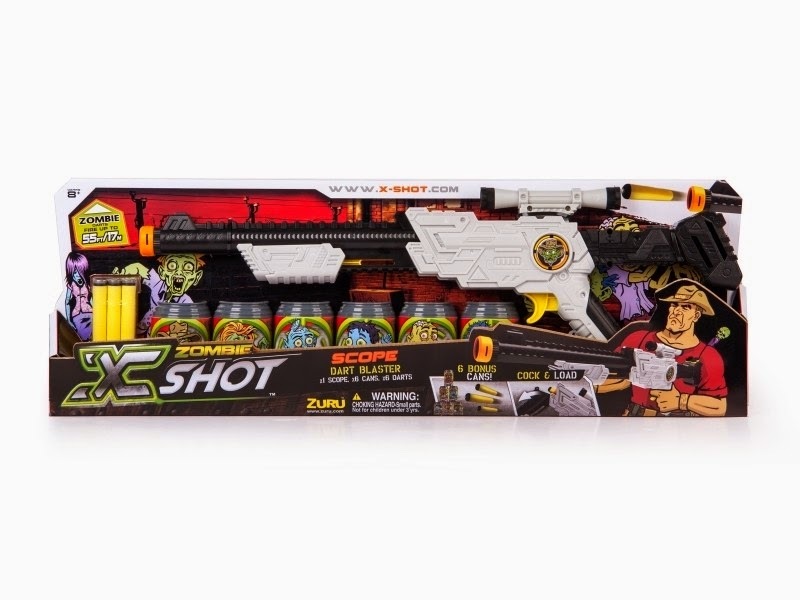 Thanks to store sites in Australia and Hungary, we've actually spotted the X-shot Zombie Scope in the wild! On both websites, many of the Zombie-series blasters (in their new packaging - the old packaging wasn't nearly as open to the air) are listed as being available in April 2014 - in a few cases, April 24th in particular. That's next week, after all the Easter goods clear out, in case you didn't know. I'll be keeping an eye on the Family Dollar and Dollar General stores stateside, and see if this pops up. Lanard Total Crush - More Repaints Spotted!